Happy Galentine's Day! Yup, that’s right, today - February 13th - marks a much-loved celebratory occasion, Galentine's Day. The term was coined by one of our favourite fictional characters, Leslie Knope, from ‘Parks and Recreation’, and it’s since become a staple celebration - with a number of essentials. Step 1: Find your bestest pals! Step 2: Grab some nail polish, and paint each other’s nails - ‘cuz everyone knows it’s impossible to paint your right hand well. 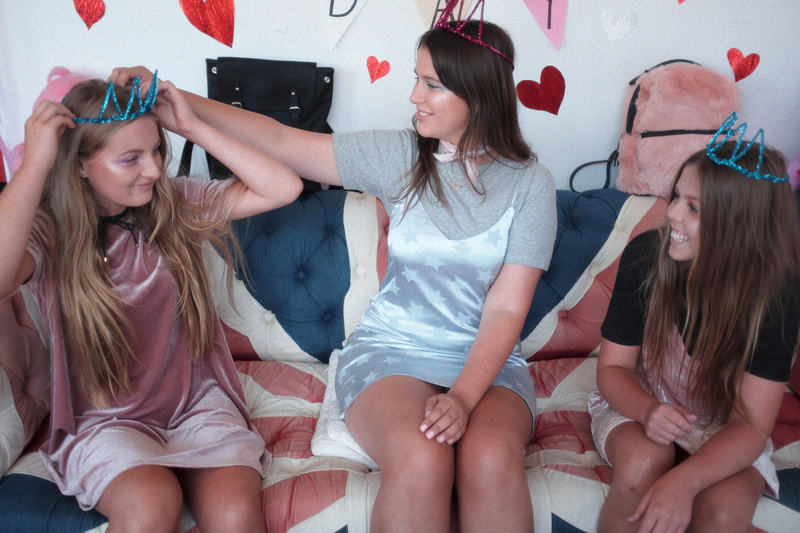 Paerau [far left] wears: Velvet Tee Dress in Pink Fizz - Glassons. Step 4: Card-making! There's nothing better than arts + crafts, especially as a way to express your love for your friends. Glitter glue is a must, of course. Lola [middle] wears: Washed Tee in Grey Marl, Star Slip Dress in Calm Blue, Square Neck Tie in Beige Rose - all Glassons. Step 5: Crown-making! Turn your arts + crafts skills to something wearable - these are made simply using pipe cleaners, but are made easier with a second pair of hands. Katie [far right] wears: Washed Tee in Washed Black, Velvet Slip Dress in Blush Rose - all Glassons. Step 6: Food. In particular, waffles. What would be a Leslie Knope approved holiday without waffles? Top with anything from Nutella, to assorted candy, or fruit for that natural sugar. Sharing is caring, especially when it comes to pink lamingtons. And don't forget to take some cute pics to document your Galentine's Day! FashionGet the look: Glassons x Alana Haim.